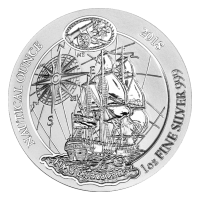 Order your 1 oz 2018 Rwanda Nautical HMS Endeavour silver coin today and enjoy the best price from our online shop! Building on the discovery vessel theme of the magnificently artful Rwandan Nautical Ounce series, the 2018 edition commemorates the HMS Endeavour, the Royal Navy research vessel, commanded by legendary Lieutenant, James Cook between 1769 and 1771. The obverse of this breathtaking coin features an uncommonly intricate rendering of the HMS Endeavour as she braves the high and choppy seas, set upon a field of geoditic lines with an antique compass design as a secondary focus, along with an insert bearing all the hallmark tools of the discovery trade...including a telescope, compass and sextant. Also on the obverse, the series title, 'Nautical Ounce,' as well as the year of release, weight, purity and 'HMS Endeavour' title. The coin's reverse features the Rwandan official seal, which bears the motto, 'unity, work, patriotism' in Kinyarwandan, the official language of Rwanda. Also on the reverse, the Rwandan legend and the words, 'National Bank of Rwanda,' all written in Kinyarwandan, along with the coin's denominational value. 2017 saw the first release in what is becoming a highly coveted series, with Christopher Columbus' chronicles in feature, it held the Santa Maria vessel in the spotlight. This coin is a must have for coin collectors and enthusiasts of all things nautical, so set sail and enrich your holdings with a 1 oz 2018 Rwanda Nautical HMS Endeavour silver coin today! Obverse HMS Endeavour setting sail. Reverse The Rwanda coat of arms. The Rwanda coat of arms. 1 oz 2018 Rwanda Nautical HMS Endeavour Silver Coin Order your 1 oz 2018 Rwanda Nautical HMS Endeavour silver coin today and enjoy the best price from our online shop! Building on the discovery vessel theme of the magnificently artful Rwandan Nautical Ounce series, the 2018 edition commemorates the HMS Endeavour, the Royal Navy research vessel, commanded by legendary Lieutenant, James Cook between 1769 and 1771. The obverse of this breathtaking coin features an uncommonly intricate rendering of the HMS Endeavour as she braves the high and choppy seas, set upon a field of geoditic lines with an antique compass design as a secondary focus, along with an insert bearing all the hallmark tools of the discovery trade...including a telescope, compass and sextant. Also on the obverse, the series title, 'Nautical Ounce,' as well as the year of release, weight, purity and 'HMS Endeavour' title. The coin's reverse features the Rwandan official seal, which bears the motto, 'unity, work, patriotism' in Kinyarwandan, the official language of Rwanda. Also on the reverse, the Rwandan legend and the words, 'National Bank of Rwanda,' all written in Kinyarwandan, along with the coin's denominational value. 2017 saw the first release in what is becoming a highly coveted series, with Christopher Columbus' chronicles in feature, it held the Santa Maria vessel in the spotlight. This coin is a must have for coin collectors and enthusiasts of all things nautical, so set sail and enrich your holdings with a 1 oz 2018 Rwanda Nautical HMS Endeavour silver coin today!